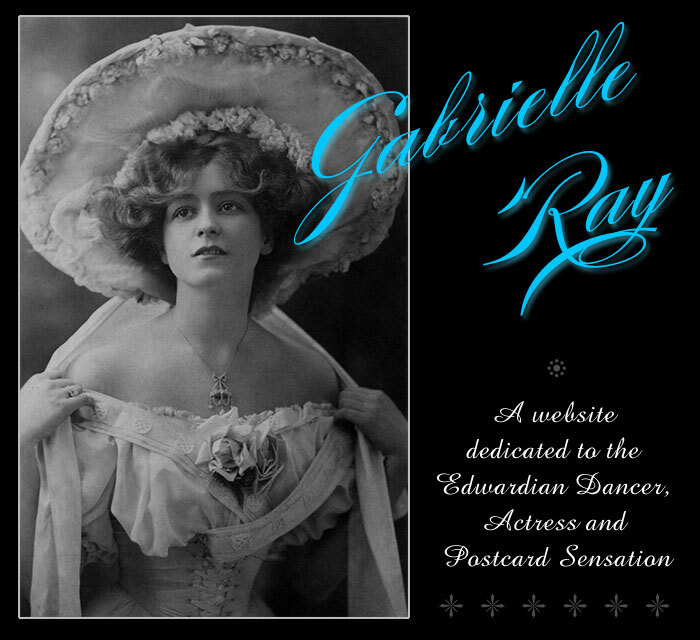 This website is dedicated to the Edwardian music hall dancer, actress and picture postcard sensation Gabrielle Ray. Gabrielle Ray was arguably the first of what we might today call pin up "supermodels". In the early 1900's she posed for thousands of picture postcards and was widely thought to be the most photographed woman of her time. The public (both men and women) delighted in her pictures which were as much about extraordinary costumes as they were about beauty. If you read the backs of these postcards you will soon see that many people were creating vast collections of them. She was famous throughout Europe and was called "the most statuesque beauty that ever appeared on the English stage". Gabrielle Ray was born in Stockport, near Manchester (UK) in 1883. She was quick to take to the stage first appearing in 1893, aged 10, in a production of "Miami" at the Princess's Theatre in London. She continued touring and acting throughout the late 1800's until she was spotted in 1903 by famous theatre manager and impresario, George Edwardes. From that point on she was catapulted into fame one major London show following another... In 1912 Gabrielle Ray announced she was retiring from the stage to marry Eric Loder. However, the marriage was unsuccessful and divorce followed. Attempting to return to the stage proved a less easy task in 1915 and while she continued to attempt to revive her career, in the early 1920s she finally lost interest. There then followed years of leading a more hedonistic lifestyle which eventually led to alcoholism and depression. In the late 1930s Gabrielle Ray was admitted to a mental home in Surrey, where she was to spend the rest of her life until 1973 when she died aged 90, to all intents and purposes, completely forgotten by the public that once so loved her. and find out more about Gabrielle Ray.